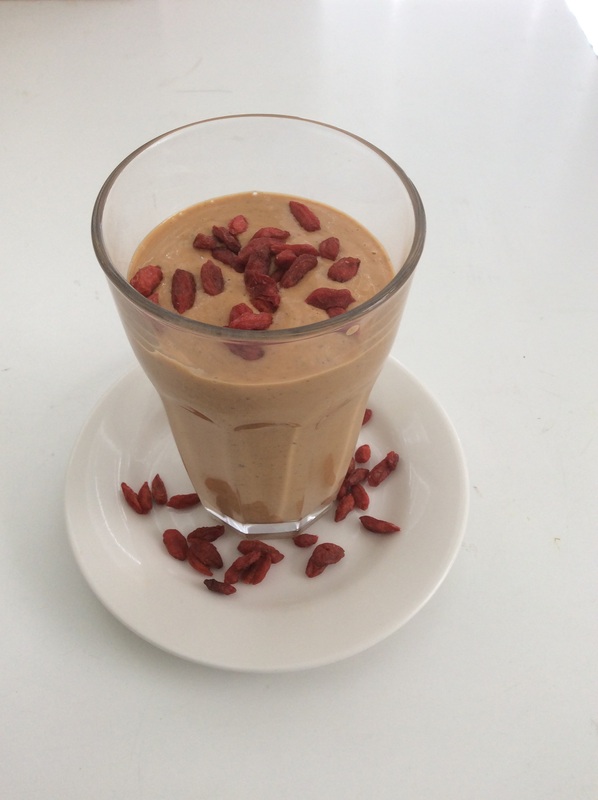 This protein-packed smoothie features Organic Raw Goji Berry Powder, Organic Shelled Raw Hemp Seeds and Organic Raw Goji Berries (we use The Raw Chocolate Company products*). It can be made in a small blender, we used the kind that can also be used as a flask, so you blend and go. I am a great believer in adaptation and substitution, so don’t panic if you don’t have everything on the list. You are advised, however, not to take this too literally as one family member did when missing out the peas from the raw Pea and Mint Soup and the lentils from the Lentil Stew! Blend all the ingredients except the Goji Berries for about 40 seconds. Pour into a tall glass and and decorate with the Goji Berries. Consume at leisure. A spoon is recommended! If you like a thicker, creamier smoothie try using cashew nut milk instead of apple juice, or more juice of you like a thinner, drinkable smoothie. This smoothie is packed with protein, potassium, magnesium, calcium, Vitamin C and lots of other goodies and makes an excellent breakfast or post-workout drink. This recipe was first featured on The Raw Chocolate Company Blog in an edited form. Posted on November 25, 2015 January 29, 2016 by thejuicenutPosted in Raw Treats, Recipe, SmoothieTagged blender, breakfast, goji berries, hemp seeds, Protein, raw, Smoothie, vegan, Vegetarian, workout. Previous Previous post: Which Juicer? – Where to Begin? Thank you so much for visiting my blog, hope you like it!